I’ve just switched my health insurance over to AIA who have an impressive rewards program attached to their policy. The program rewards me based on the amount of activity I do each day. To make sure I receive offers from the rewards program like up to 50% off Qantas flights, Hoyts Cinemas, Endota Spa treatments, Woolworths etc., I need to track my heart rate as well as the steps I walk daily. 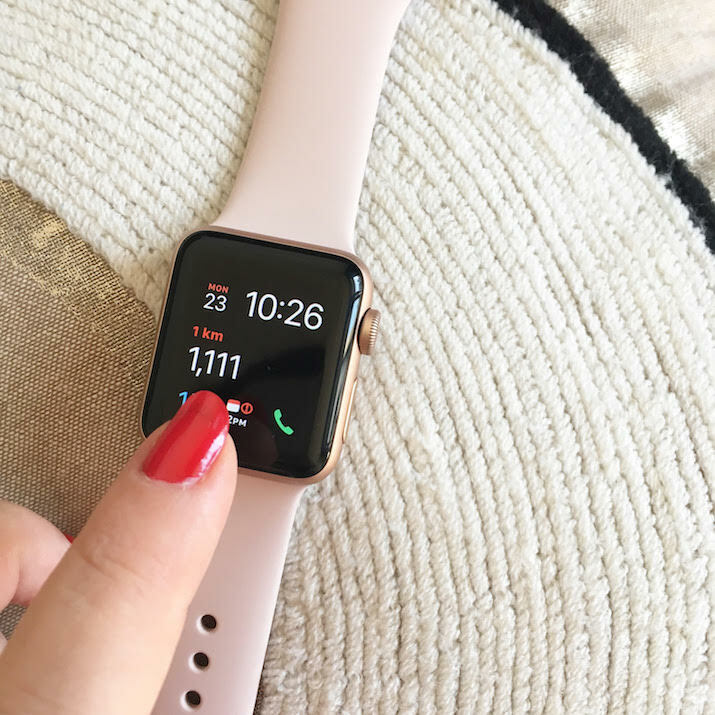 So after tossing up between a Fitbit and the Apple Watch, I decided to give the Apple Watch a try – and I’m pleased I did! I’ve been using my new Apple Watch Series 3 for over a month and couldn’t be happier. The watch has drastically reduced the number of times I check my iPhone, which is draining. I also love the idea of being able to spend my precious time with my baby Hercule and less time on my phone because I’m worried I’m going to miss out on an important message, phone call or an email, which now all go directly to my watch. It’s easy to swipe the small calendar icon on the watch face to see what I have on each day. I can’t reply or send emails on the watch (and why would I) the screen is too small, but I like the fact that I can instantly preview short snippets of my emails received. I need to check the temperature each night to see how many layers I need to put on Hercule when I tuck him in at night. With just one tap I now know the temperature for both day and night. This is such a cool feature; the watch has 3 different lights that light up the entire watch face. This light is very helpful for when I get up at night to check on Hercule. This is probably the main reason I want to buy this watch for my mother. With one click of the side button, you can make an emergency 000. Your important health information stored in the Health app that is sent through if I ever need to call 000. The watch also notifies my loved ones if I’ve called 000. I don’t carry a wallet and can’t stand the thought of having to keep any more retail reward cards. So I’ve uploaded most of my reward cards to a loyalty card app called Stocard which I then access on my watch when I need to scan my cards in store. The Apple Watch is very practical, well priced, lightweight and extremely comfortable to wear all day and night. I wear mine with a light rose coloured silicone band which is perfect because the back of the band (where it closes shut) is flat and won’t scratch Hercule when I’m playing, holding him or resting his head on my arms to feed. The battery lasts for about 3 days, which isn’t bad at all considering I use the watch during the day and night. To charge, I just put the watch on its charging dock every time I shower. Overall I’m delighted with the watch. It’s made my life easier and more pleasant by drastically reducing the need to use my phone. I can’t to take it to the next level and use it more for my fitness.